Too many factories have appeared in the market in recent years. Most of them just followed the road which Noob and other famous factories have created. 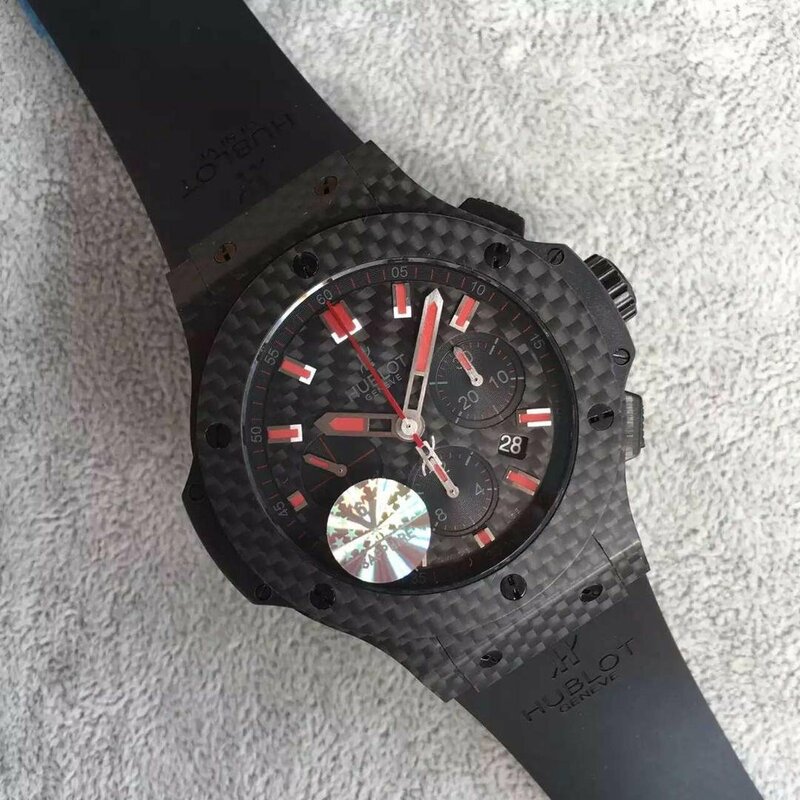 Few of them are innovative in watch-making technology and make great replicas, however, there was one factory called JJ, published a great replica of Hublot Classic Fusion, is exactly the one I will introduce today. Actually this is the V2 edition that was updated because V1 only used Titanium material on bezel, now the updated version used Titanium on whole case, it is a great improvement because Titanium is more light in weight and more scratch resistant. 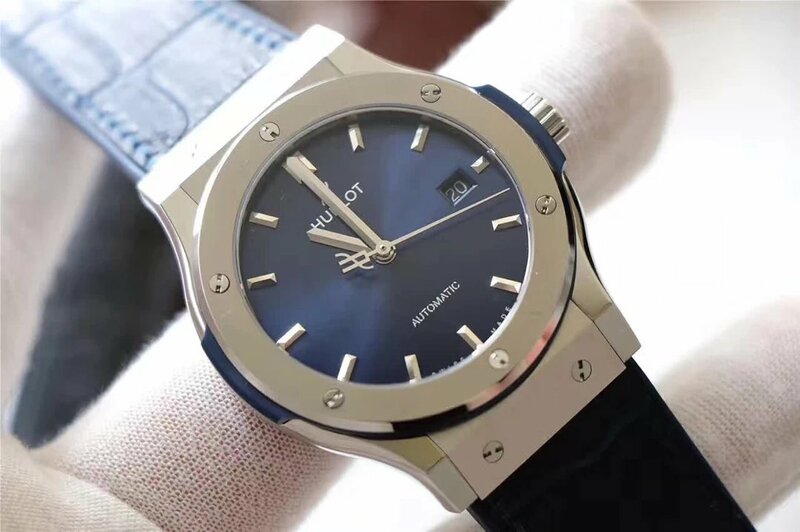 Hublot is very popular in sports watch field, everyone who is interested in football will know this brand, it is a great idea to buy such a masterpiece if you are a football fan. 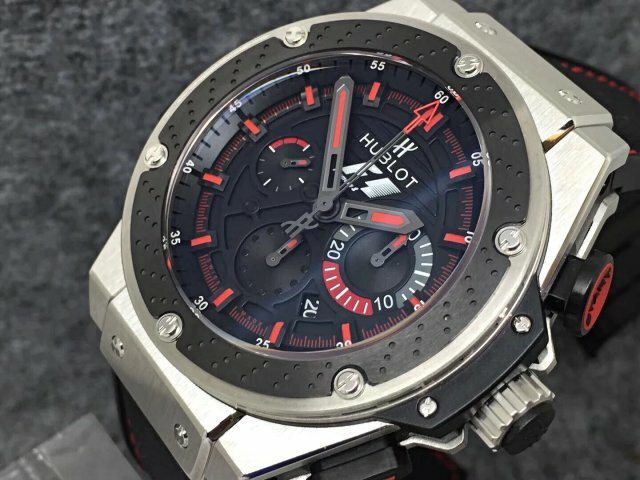 The watch here discuessed is a 1:1 high end replica, although much cheaper than genuine model, it also has a higher price than those Hublot replicas from small factories. 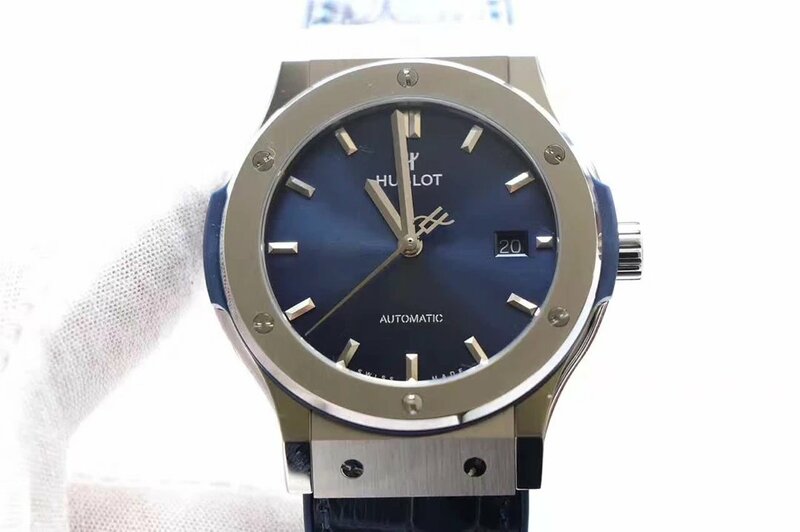 I do not want to talk the history of JJ factory because it is newly established, but according to saying of my watch supplier, this factory only manufactures top quality Hublot replica, they will only do this thing in the future too, so you Hublot lovers are very fortunate. 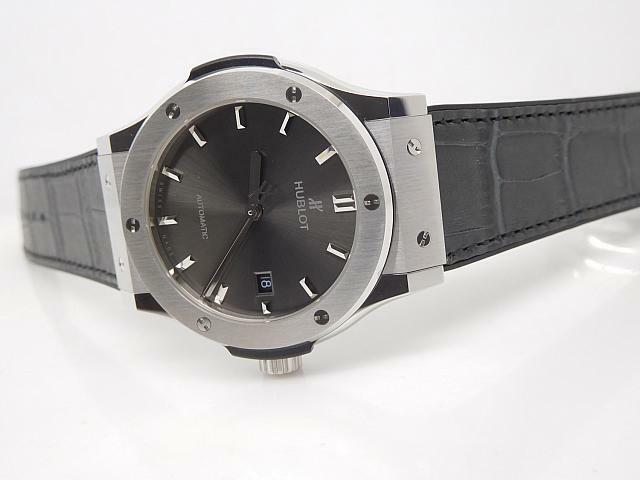 The watch belongs to Classic Fusion series of Hublot, it is in silver grey tone, a low-key watch but looks very elegant. 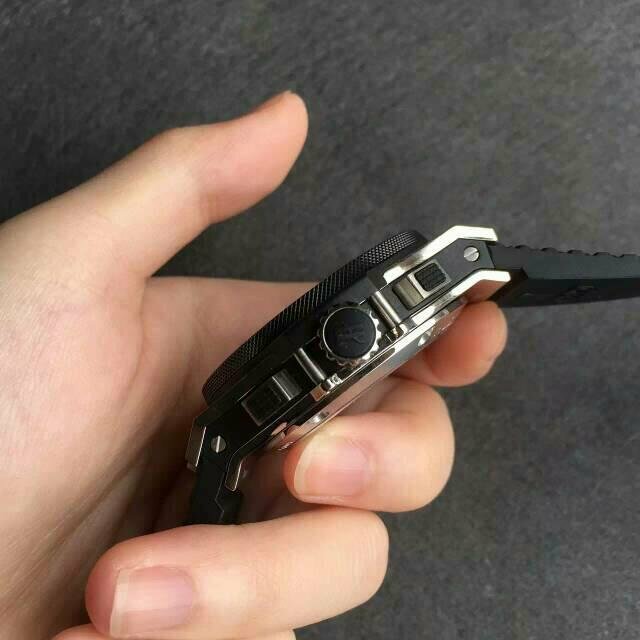 Brushed Titanium case, the bezel features H-shaped screws and its round edge is polished like a mirror. 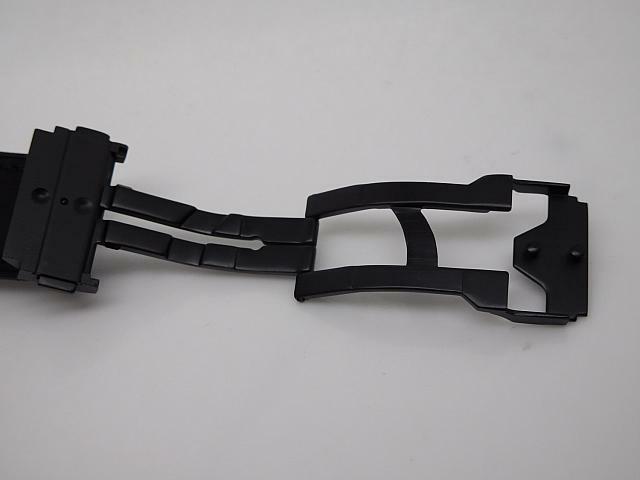 Case back is see-through crystal, while the screws on case back rim are one-word style. 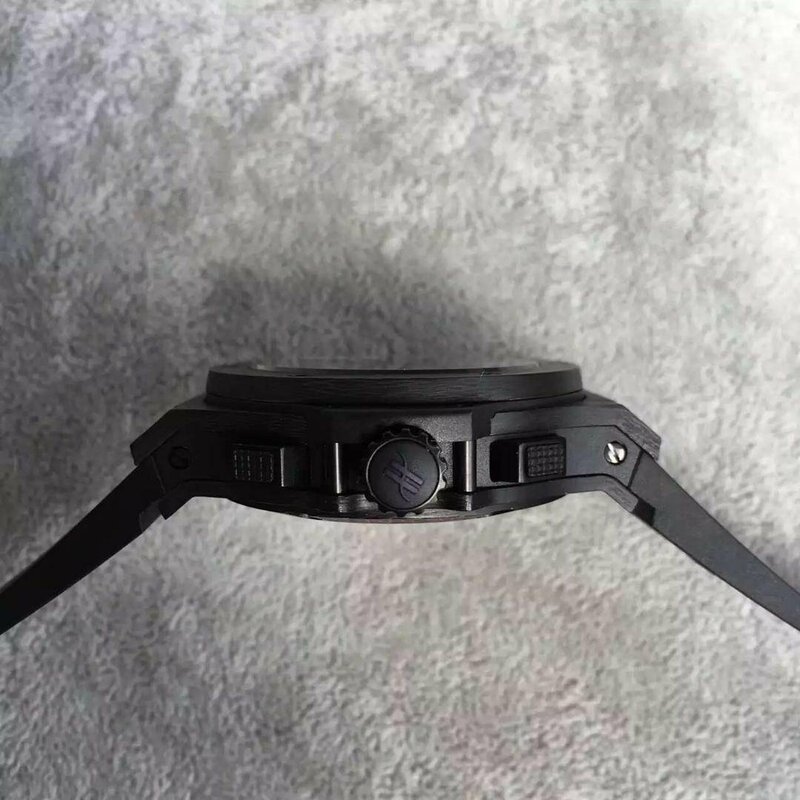 The dial is in grey color, hour markers in steel are very classic because these 3D markers give you a very strong three-diemensional effect. 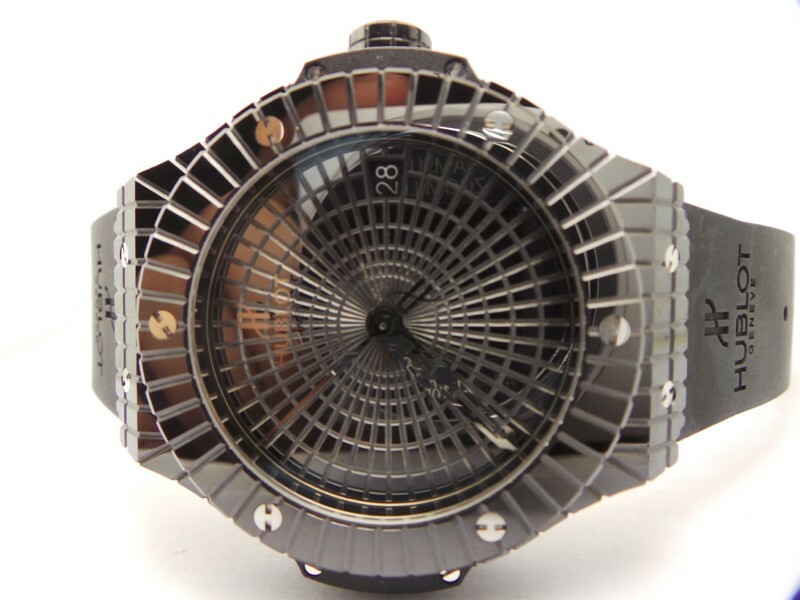 The dial is very simple but exactly such non-complicated dial could make the replica 99% the same as genuine. A square date window has white font in black background, you can change the date through crown adjustment. 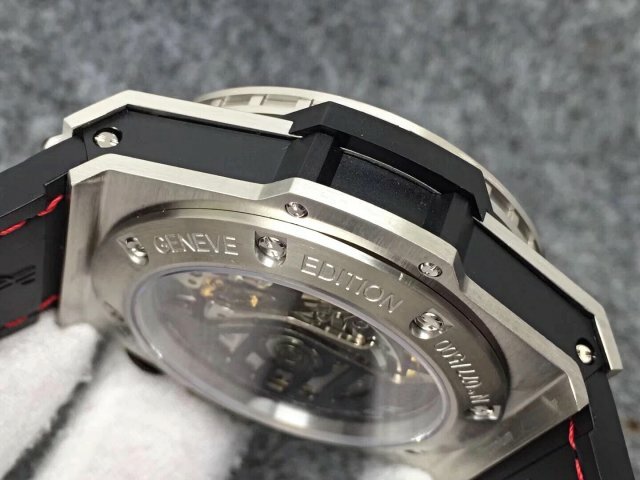 The manufacturer offers two options for movement, one is Asia ETA 2892-2, the other is a grenuine Swiss ETA 2892-2, the later needs extra $108 usd. 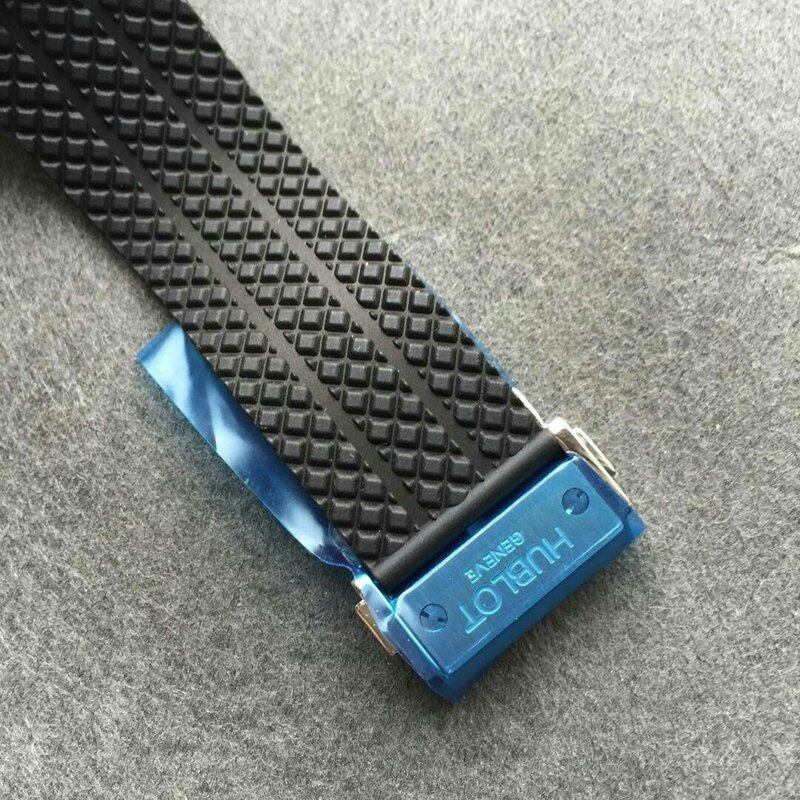 The band is specially designed, gummy leather with black stitching outside, black rubber inside. 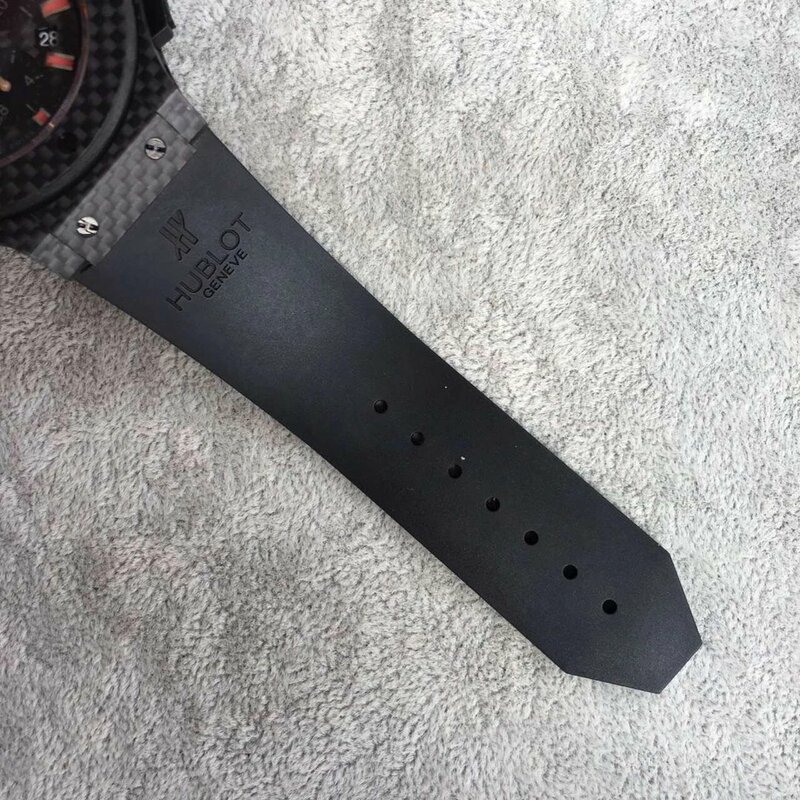 The rubber side has correct Hublot logo and lettering. 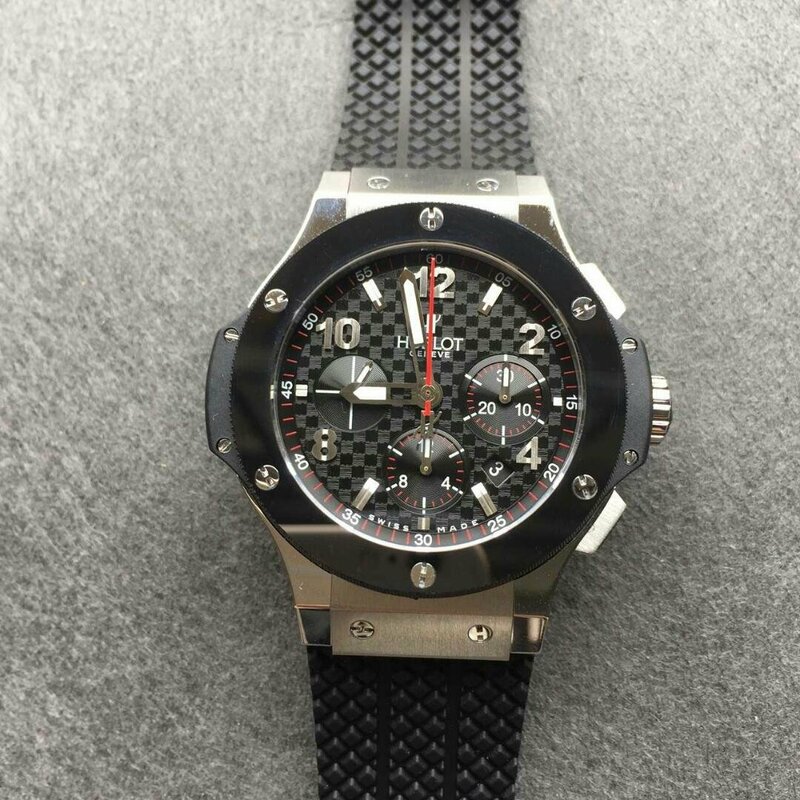 If you are seeking for a non-chrono Hublot replica,this one could a perfect choice for a long-term wear. I love football, I guess you all love it because there is a close relationship between watch and these sports. Football is a passion sport and Manchester United is one of the greatest football clubs in the world, I am sure a lot of readers here are fans of Manchester United Football Club. Yes, I am the one, and more determined when the famous coach Jose Mourinho entered Manchester United Football Club. 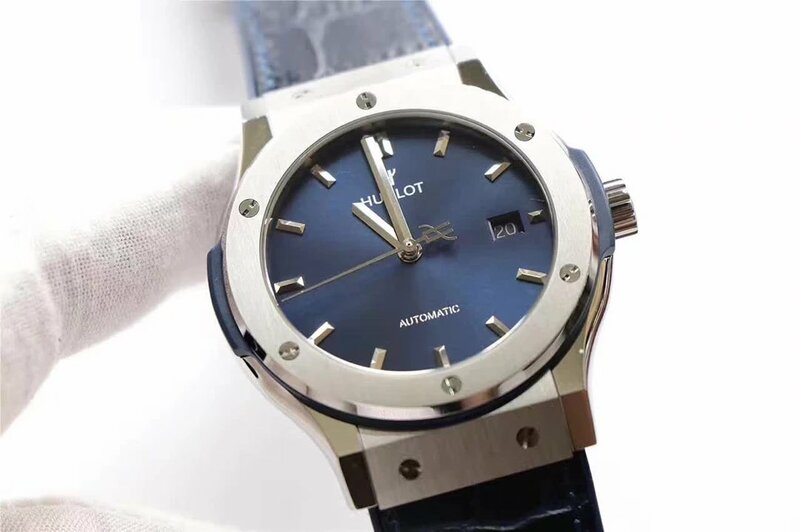 Lots of watch brands have relationship with sports, for example, Rolex with Tennis, Longines with horsemanship, and you will associate Hublot with football. 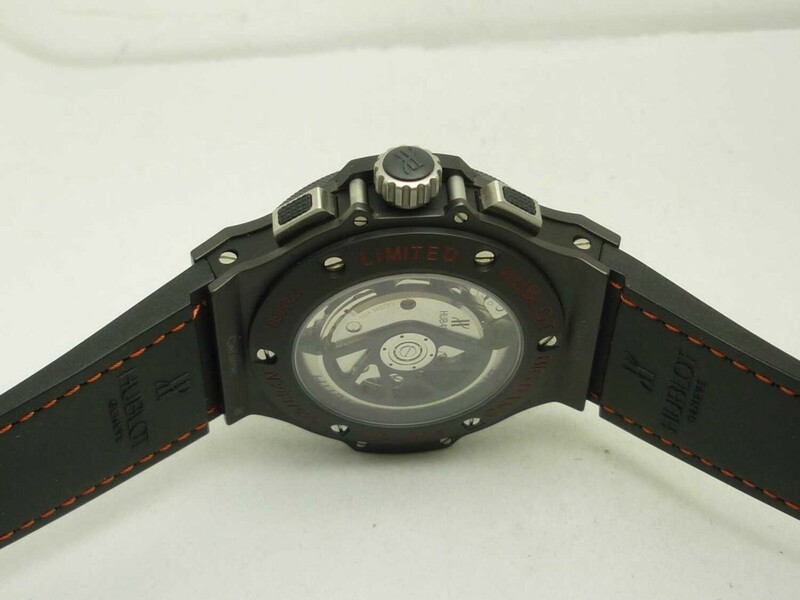 Yes, this Swiss brand has published a lot of special edition watches for this sport and famous football players such as Maradona. 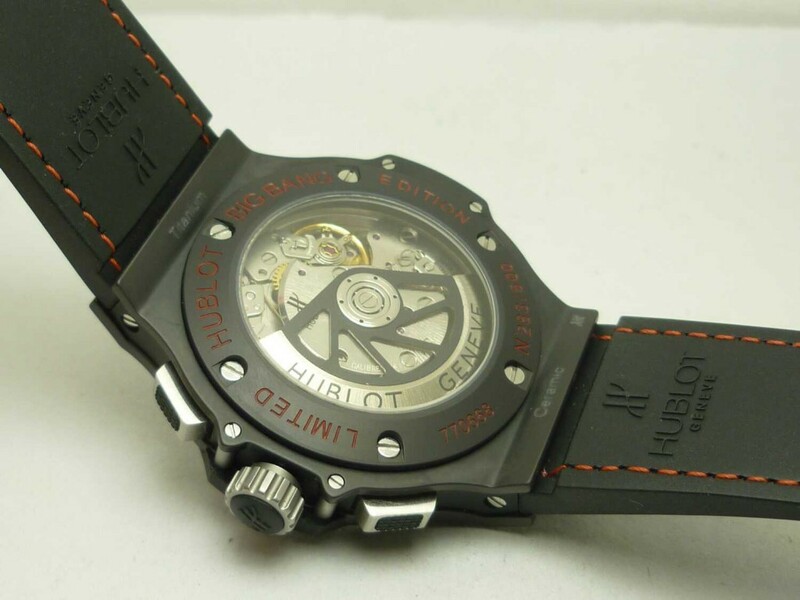 Now, the Hublot Red Devil watch is a special edition which Hublot published for Manchester United a few years ago. 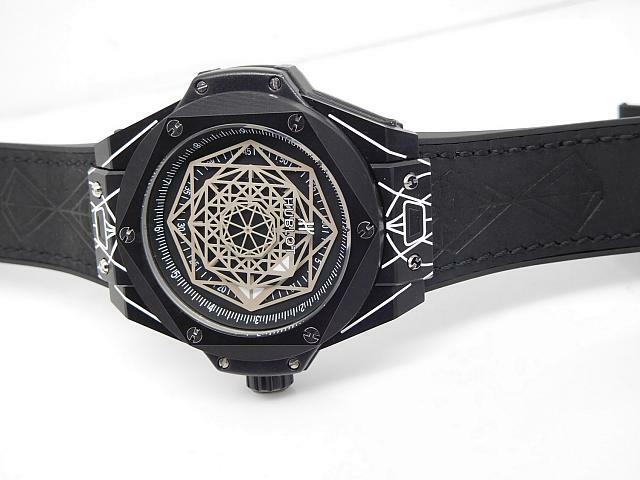 The replica watch here was already available in 2009, I still remember it became the best seller when firstly being introduced to the market, a lot of clients all over the world came to the factory to ask about this replica watch. 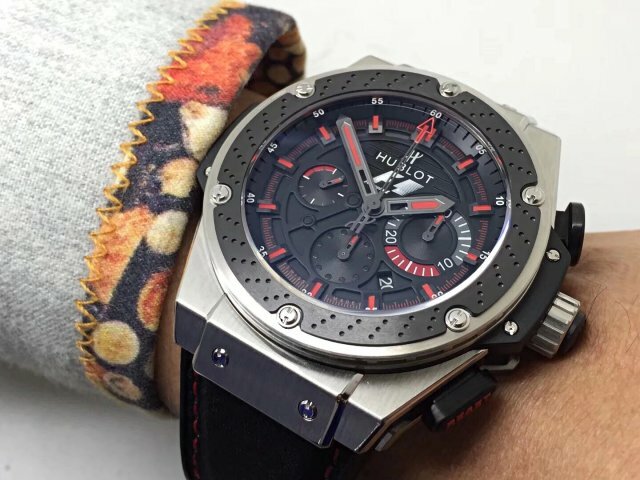 Now after nearly seven years, Hublot Red Devil replica is still on hot sale, it is still on the way to pay tribute to Red Devil’s spirit. 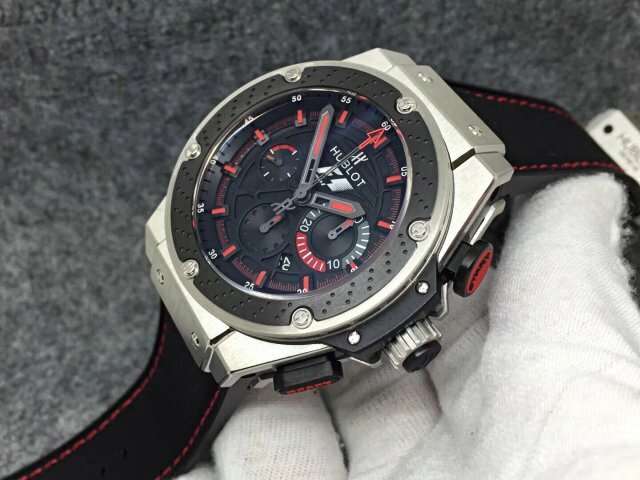 Black and red are two main colors of the watch. 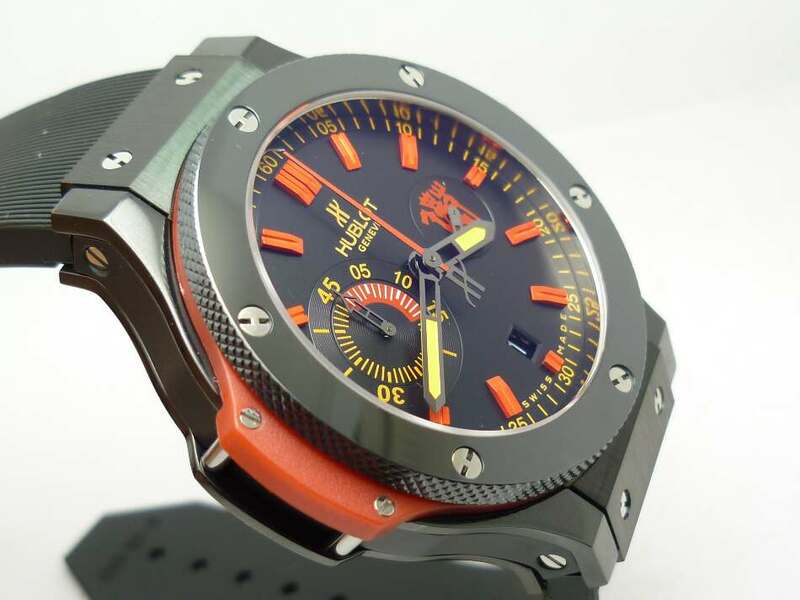 The case is made of solid 316L stainless steel, its surface has thick black pvd coating. 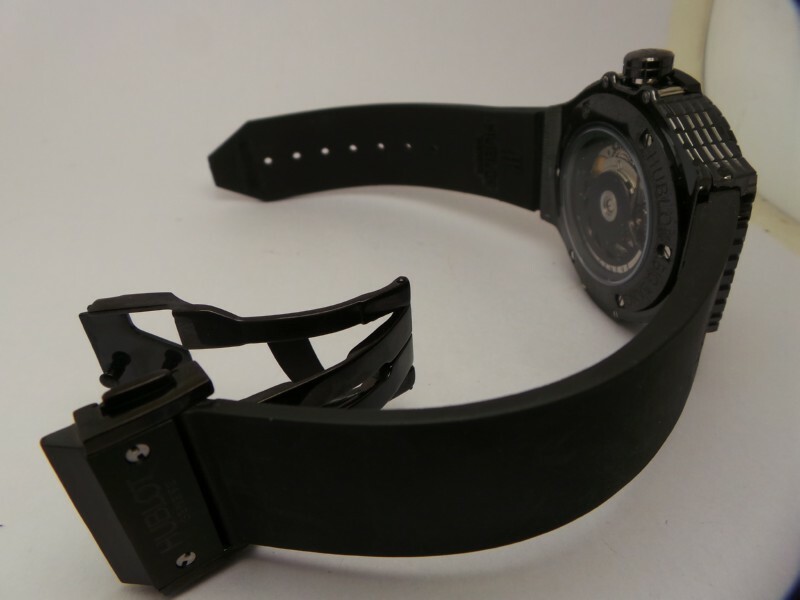 While the bezel uses real black ceramic and fixed by six brushed screws. 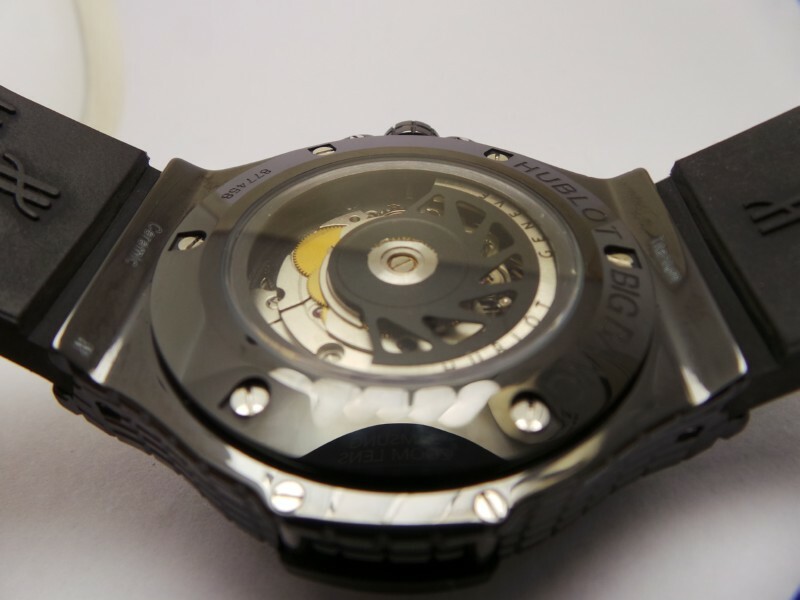 Case is measured to be 44.5mm in diameter and 16mm thick. Case back is solid and has white engravings on edge, and on the center, there is a big trophy icon, is this a trophy for Premier League or UEFA Champions League? Because of the ceramic bezel, the watch is a little heavy and you can absolutely feel its high quality texture. 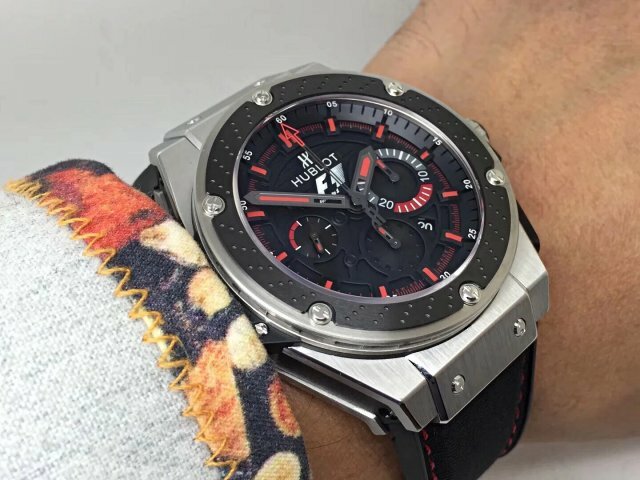 Steel, ceramic and rubber are all mixed into this watch, with accurate 7750 chronograph movement, the replica is a classic fusion of high quality watch materials and technology. 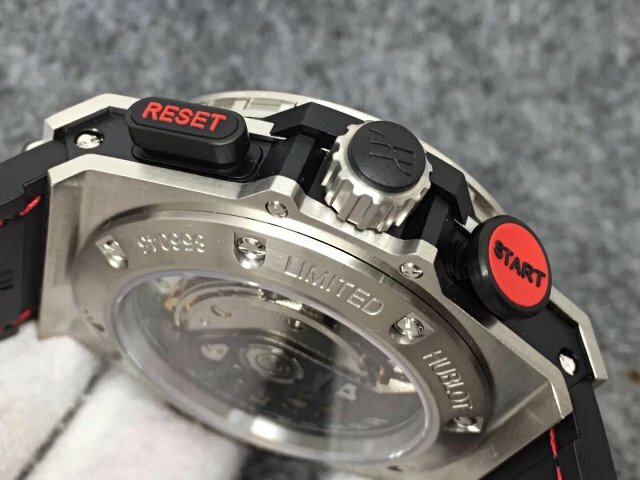 Black dial is the place that fully shows Red Devil elements. 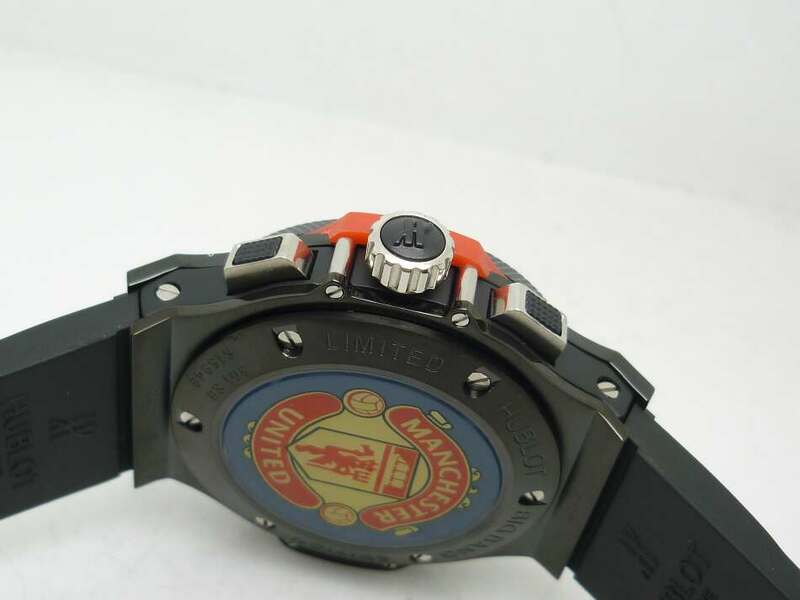 There are red and orange colors on black dial, red and orange are exactly two colors of Manchester United Football Club’s flag. Let’s check more details of the dial to see how it displays time. There is a red devil logo at 3 o’clock, the small second hand is working smooth there. 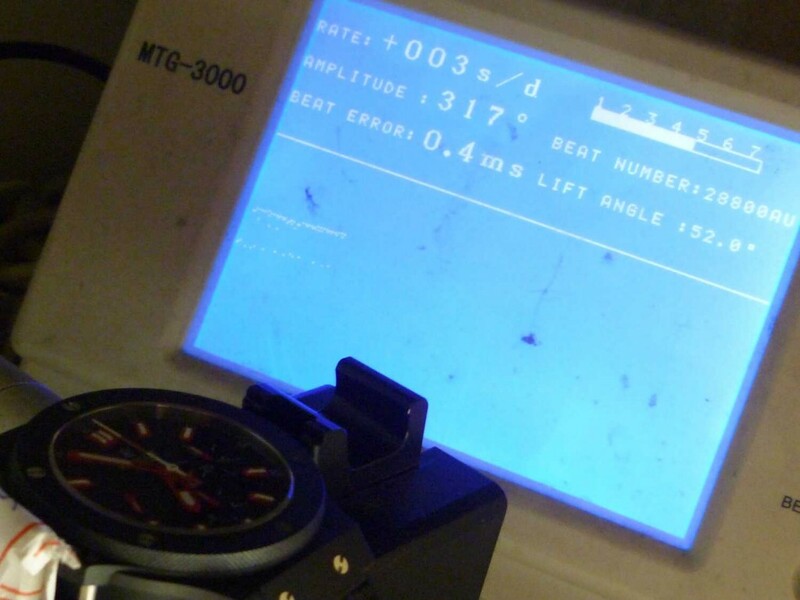 A 45-minute chronograph subdial is positioned at 9 o’clock, this chronograph counter uses orange and red markers. All hour markers are in red. 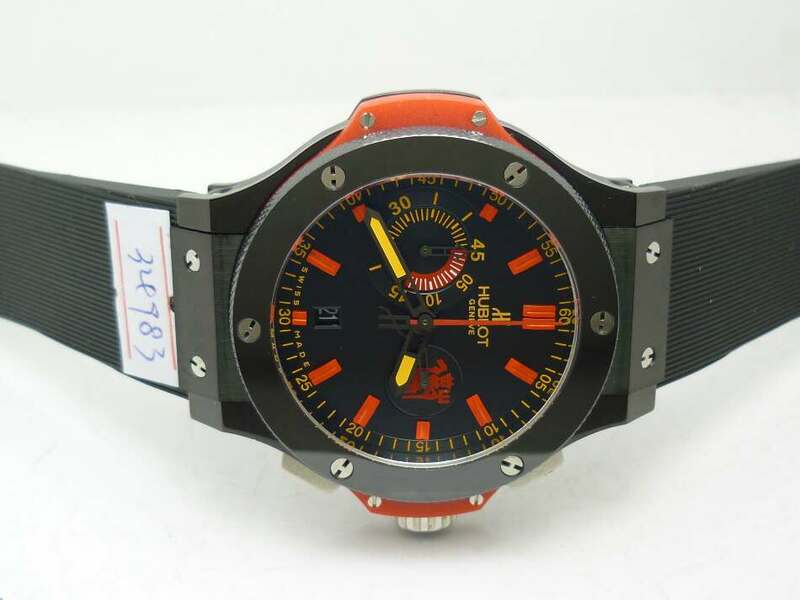 The central big hand in red is for seconds chronograph, the other two hands of hour and minute are applied orange luminescence. The date is displayed in a small window at 6 o’clock. 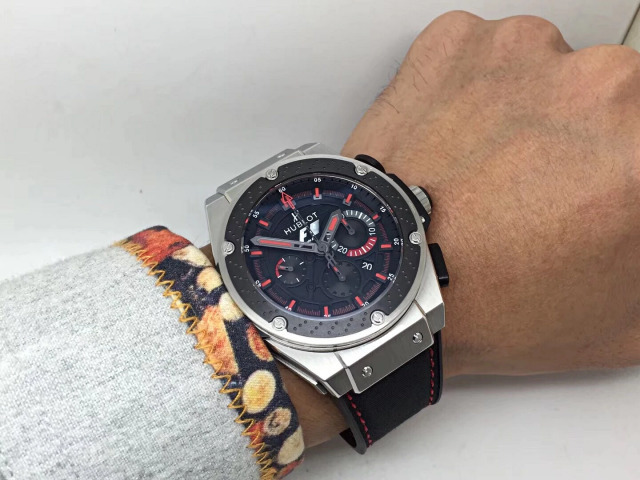 Finally about movement, it is an Asian 7750 chronograph. 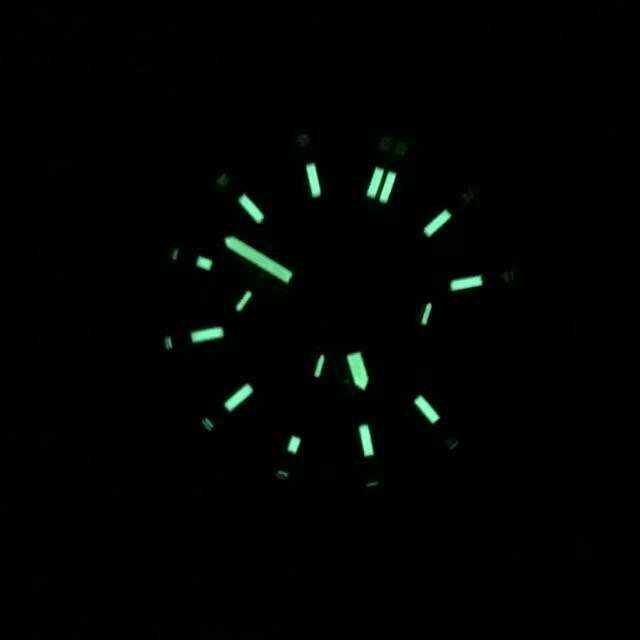 Compared with those 7750 Secs@9 and Secs@12, the 7750 movement that runs Secs@3 is more stable because it has less modification on the basis of original movement. 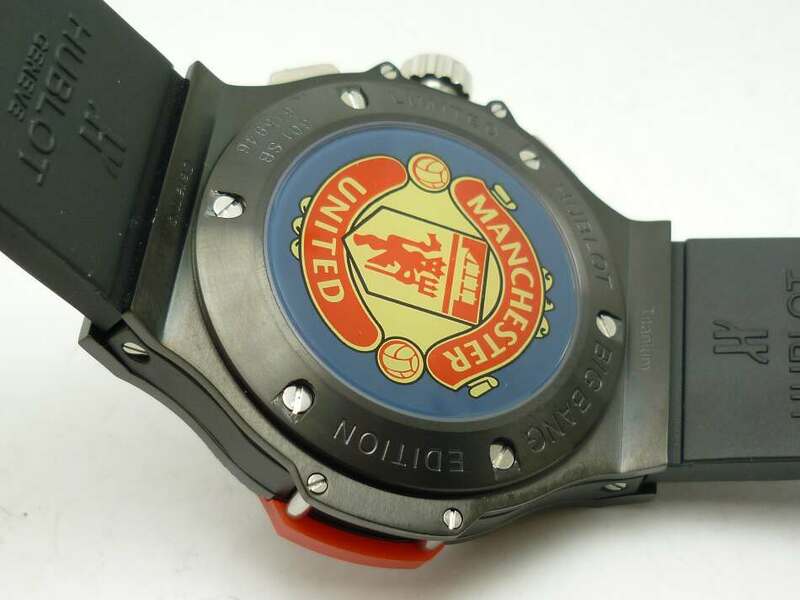 If you are Manchester United fans and also love footable sport like me, why not buy a replica Hublot Red Devil watch? 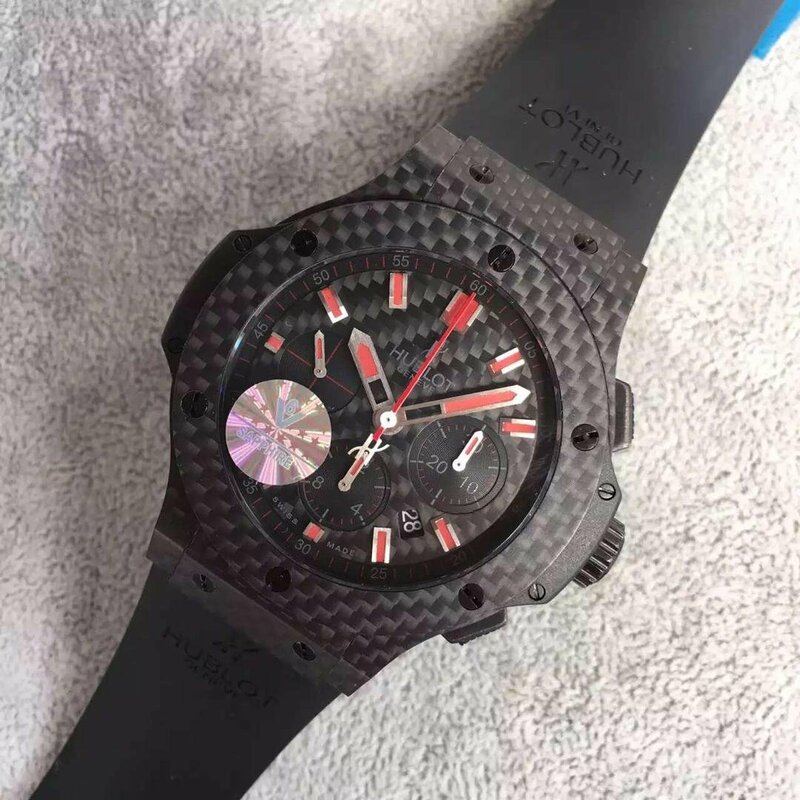 I did not give too many reviews about Hublot before, especially like this one with luxurious appearance, because I always thought that Hublot is a sports brand, the case material that is most suitable for it should be carbon fiber, other than ceramic. 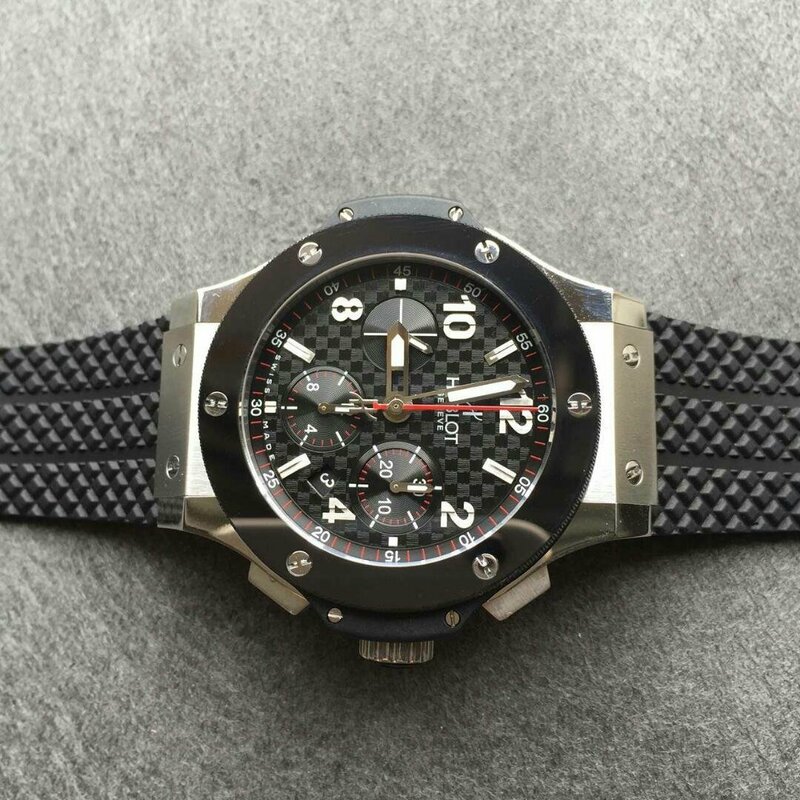 This brand which we usually saw it on football field is actually a fusion watch that combines different watch-making materials. 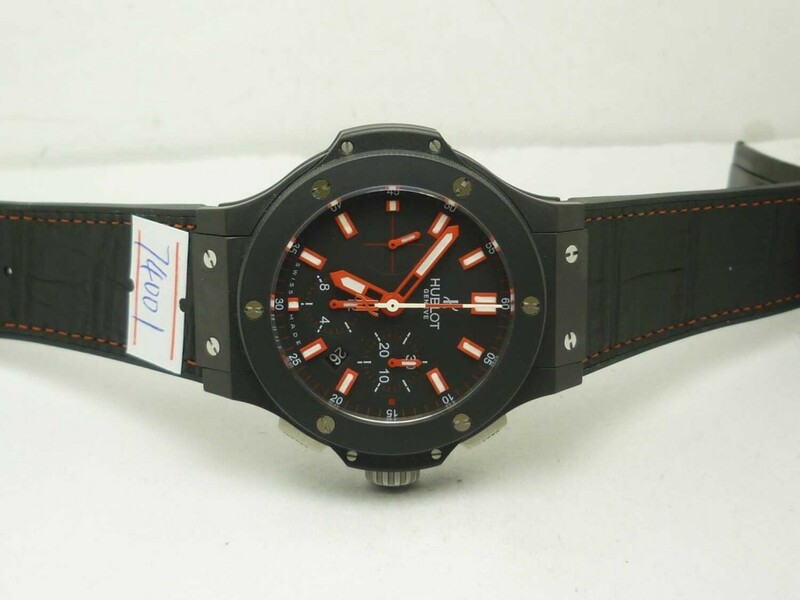 This one, Black Caviar, also inherits the design essence of Hublot, it is a combination of ceramic, rubber and titanium. 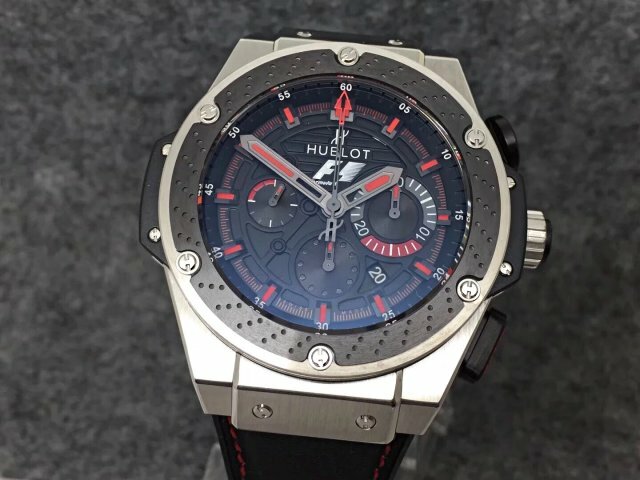 The replica here I am about to review is a great timepiece from H factory, it is the best Hublot Black Caviar replica currently, no other versions existed, only H factory makes it. 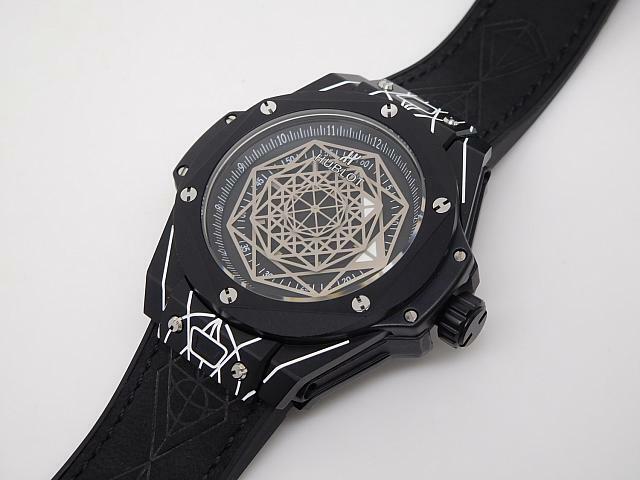 The whole case is made of black ceramic, it is measured to be 42mm in diameter. 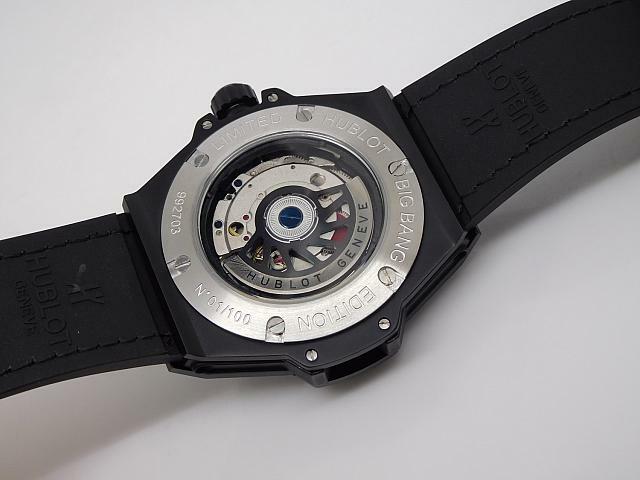 As its name, the main color is black except 14 Titanium screws on case. The watch body feels very heavy because of solid ceramic usage. 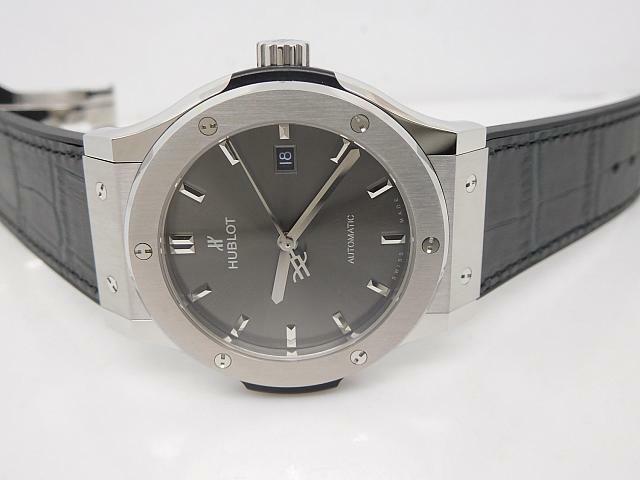 High gloss finish on case and bezel, the crown is also ceramic and protected by rubberclad, there is a classic Hublot Logo on the crown, which has a sandblasted finish. 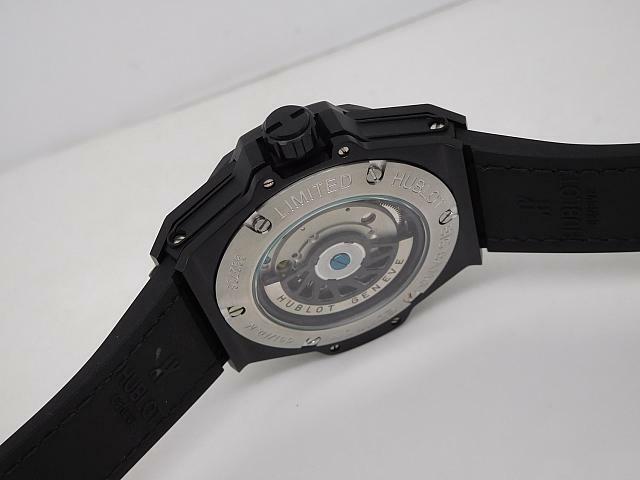 Although I do not like this watch very much because its high price and non-sporty outlook, it made the first innovation on the dial material because this Black Caviar replica uses a real ceramic dial, before, no replicas use ceramic dial. 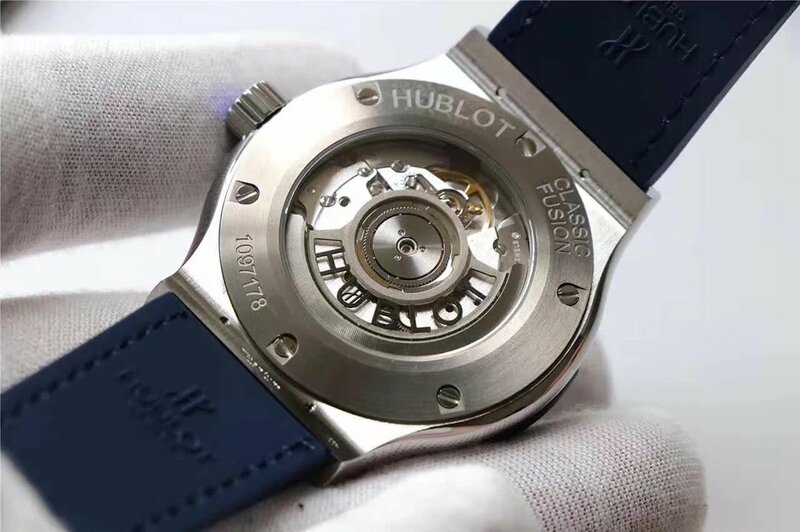 Central hour and minute hands are hollow out, while the end of second hand has its icon like other Hublot watches. White date font is very obvious in black background. 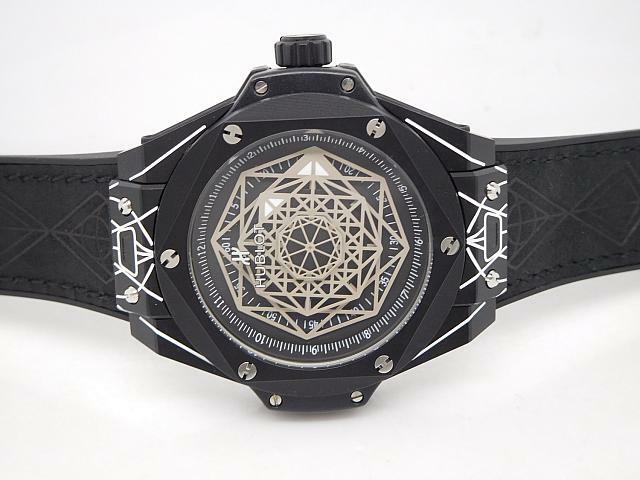 I do not want to walk around while wearing such a ceramic watch, because once it is being collided against hard object, the ceramic will broken. So, if you do not want to take such a risk, just wear it with your suits in formal occasions. 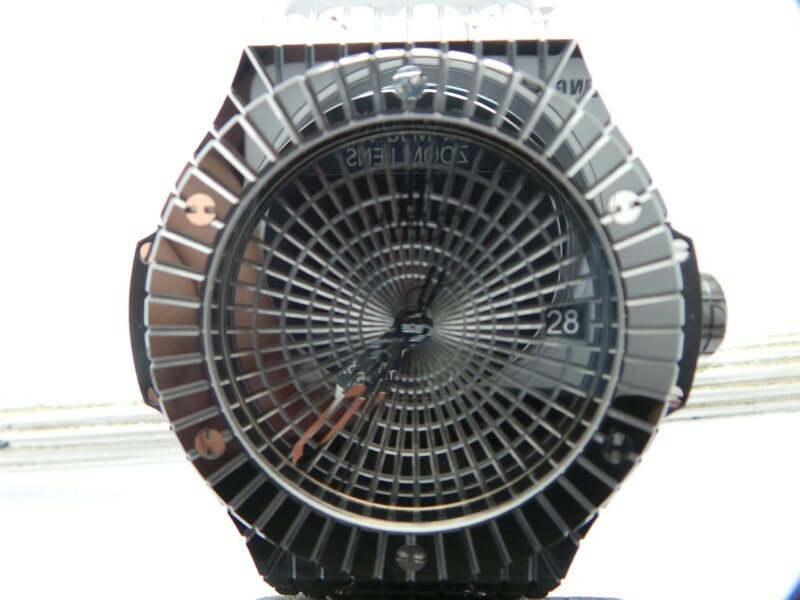 See-through case back clearly show a genuine Swiss ETA 2824-2 movement, which is also one of the reason to explain its expensive price. 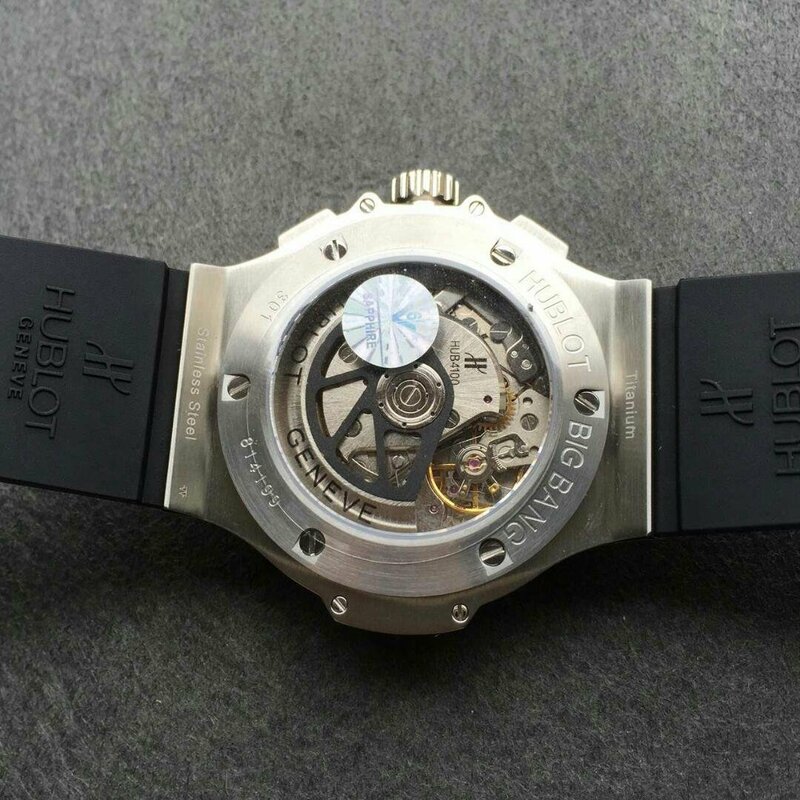 The auto rotor is skeletonized and has correct engravings of “HUBLOT GENEVE”. 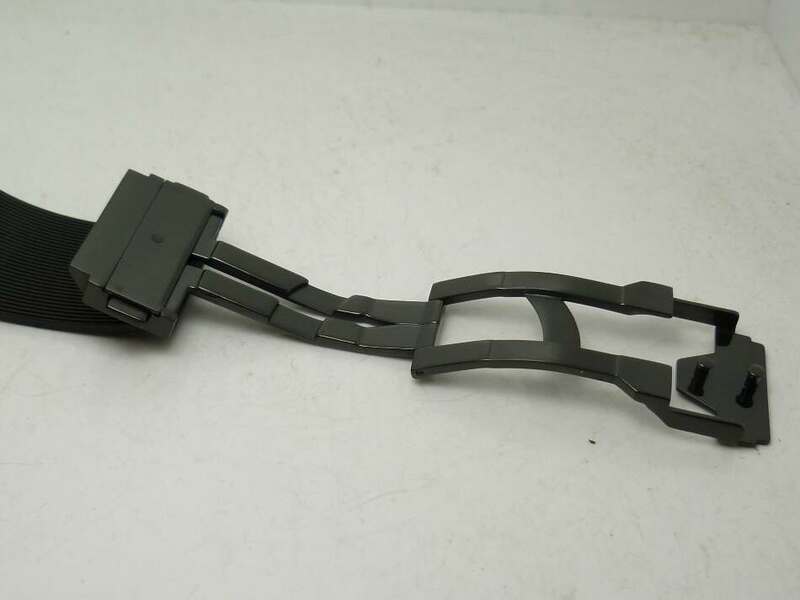 The index regulator is working, you can clearly see the symbols “+” and “-“, which are for you to adjust the inaccuracy. 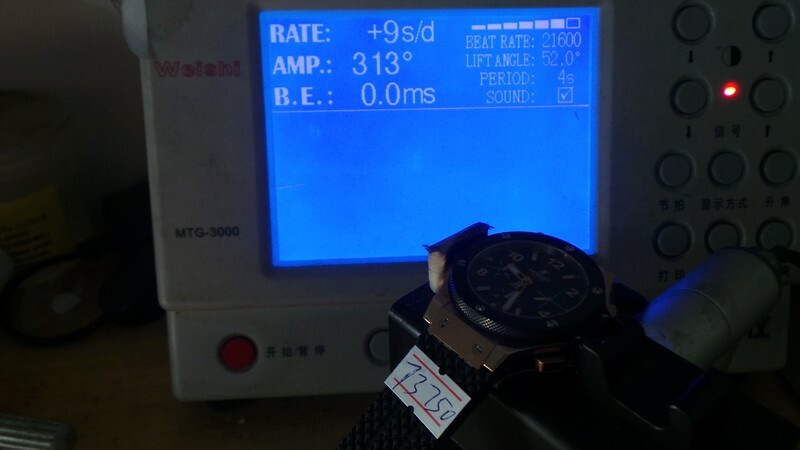 Fortunately, the replica watch runs very well and shows a perfect accuracy, look at the testing result below, it is only 4 seconds slower each day, that’s a normal error for a real ETA movement. 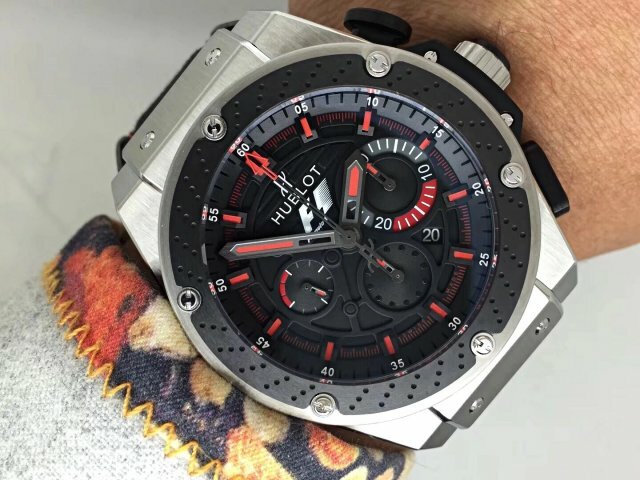 Usually Hublot combines precious metals with ceramic or carbon, so the case is very expensive, their movement is researched and developed by themselves, so the whole watch has a sky high market price. 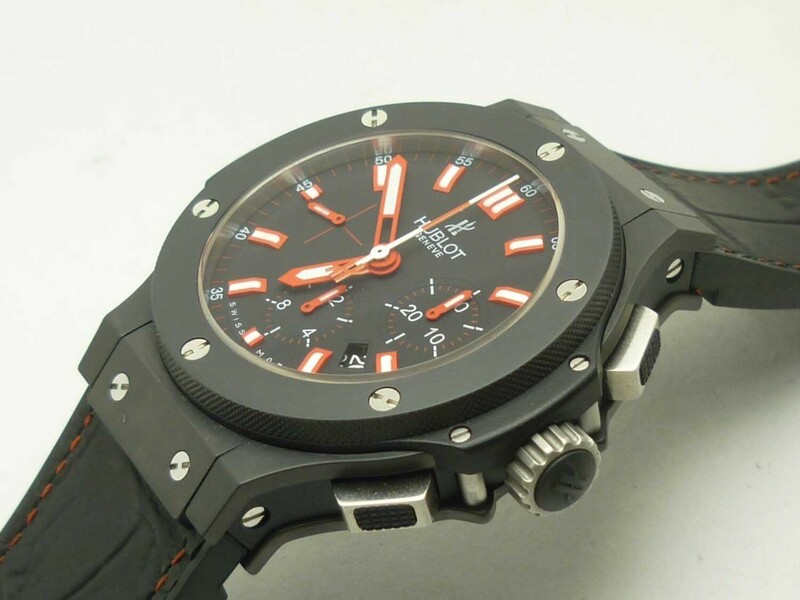 Therefore, a lot of people turned to buy replica Hublot. 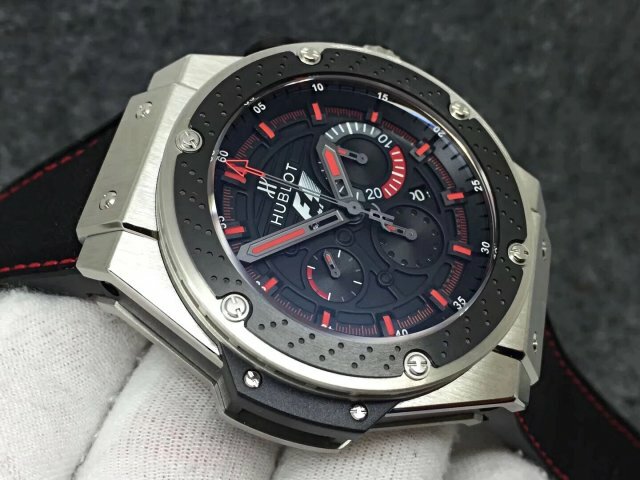 However, how to get a top quality one, that is a question, first, you must find a trusted source that could offer you the best quality replicas. 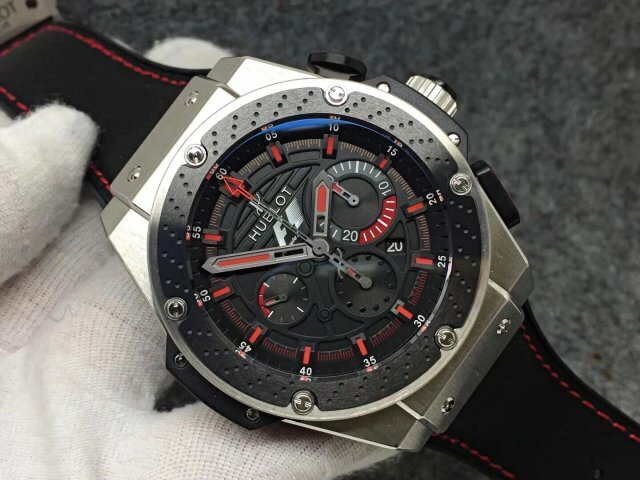 The purpose I created this blog is to bring convenience for people who want to find a good replica watch source. 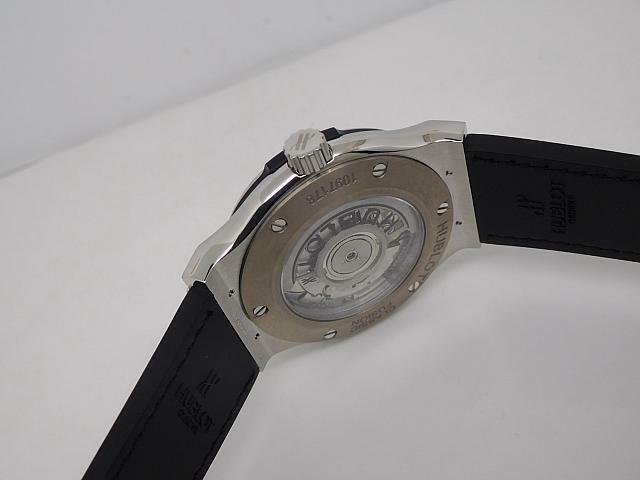 The movement inside is HUB4100, which is cloned on the basis of 7750, although not original HUB4100, the movement itself has correct original engravings, the base movement plate also features clear Geneva Stripes. 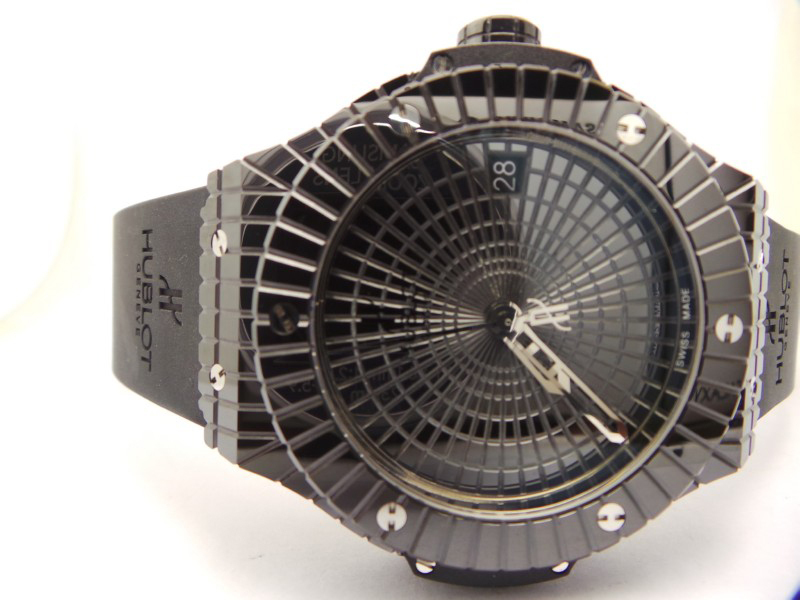 By the way, the best-selling point on the replica lies in its dial, which uses carbon fibre. 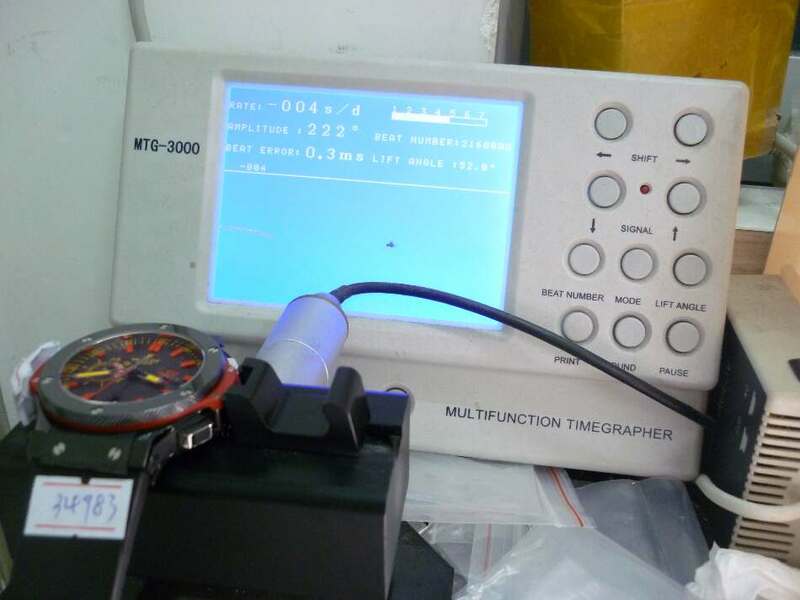 Because of being driven by 7750 movement, the chronograph function is working like genuine and the samll second hand is running on the subdial at 9. Central big red hand is eye-cathing and exactly echoes with the red minute scales on big dial and two subdials at 3 and 6. 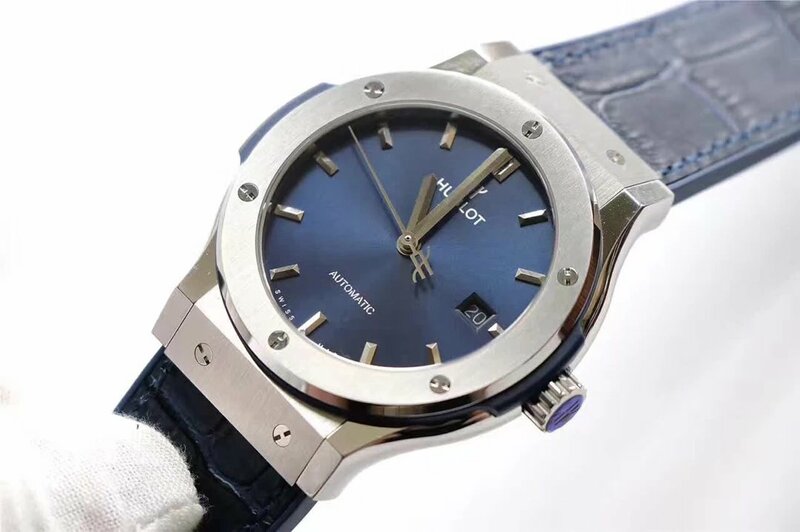 Recently there are a lot of people who have read my blog ask for the price of some watches, and most of them want to buy Hublots, so here according to their requirement, I will make a review about a Hublot Big Bang Rose Gold Replica Watch. 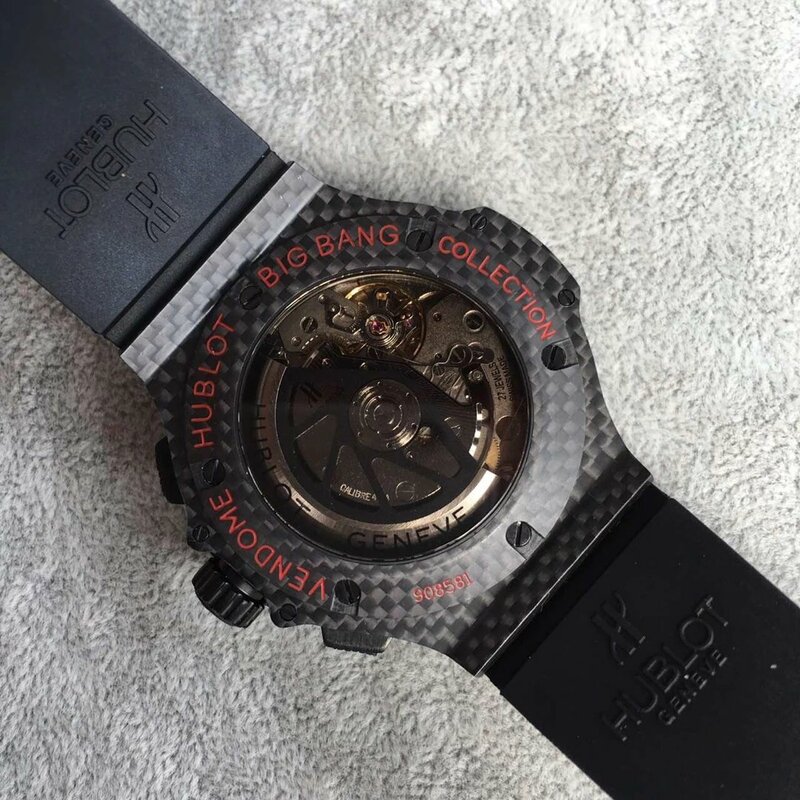 Besides Carbon Fiber Big Bang, the rose gold version is also the best-selling one. 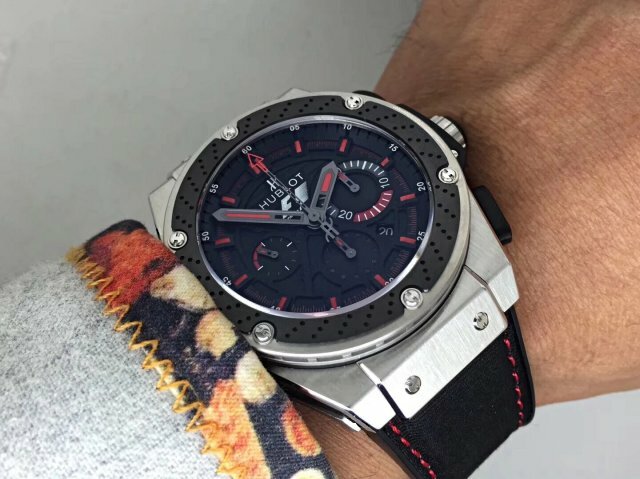 Readers of my blog usually ask why these replica watches shared on my blog are marked with a high price, I have to say that only high end replicas are worth buying, those sold at $80 could only last for several months, do they worth your money? 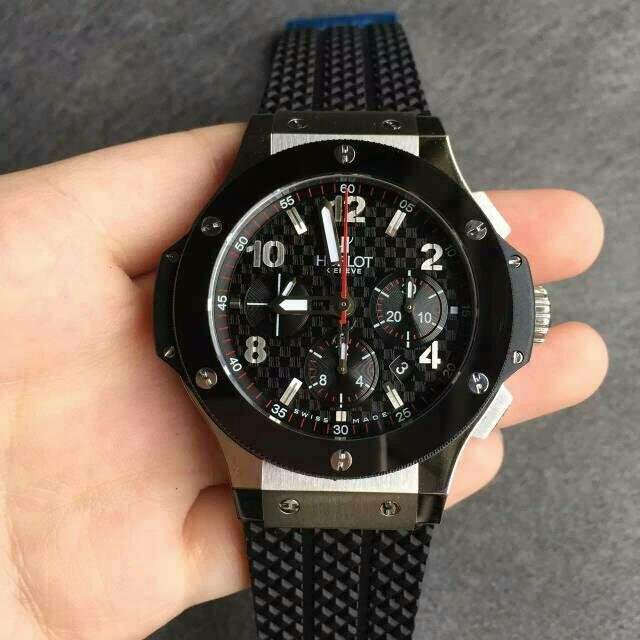 I do not think so, a good replica not only offers accurate timing, it also becomes a good alternative of your genuine watch. 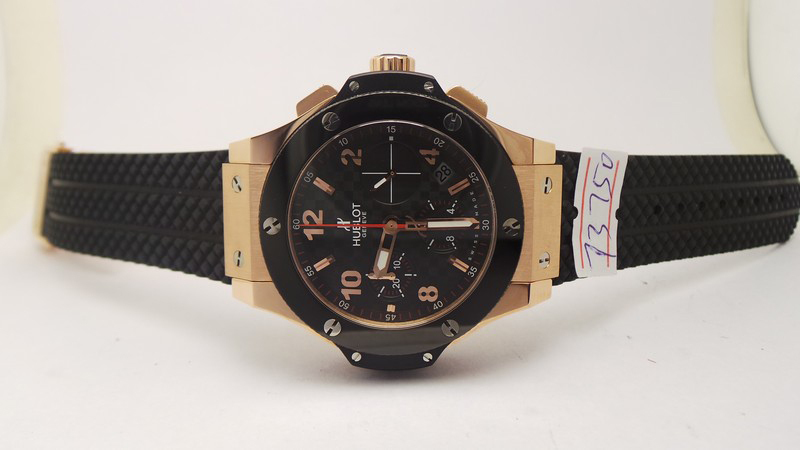 This Hublot Rose Gold replica is made of solid 316L stainless steel, classic porthole-shaped case has been plated with thick 18K rose gold coating. The crown and chrono buttons all have rose gold plating. 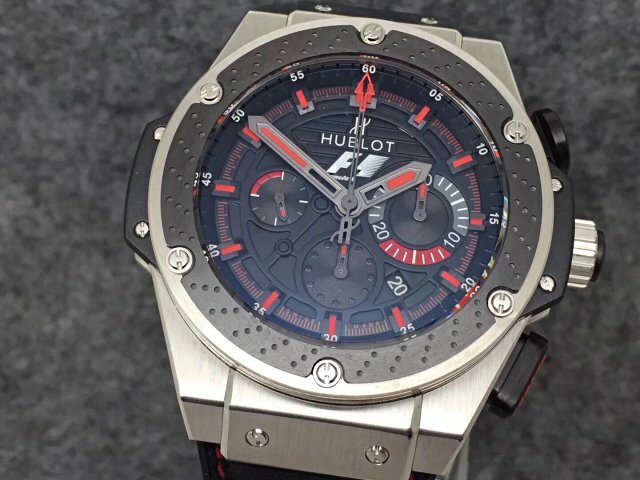 Like genuine Hublot, this replica also uses four materials, stainless steel, ceramic, rubber and carbon fibre. 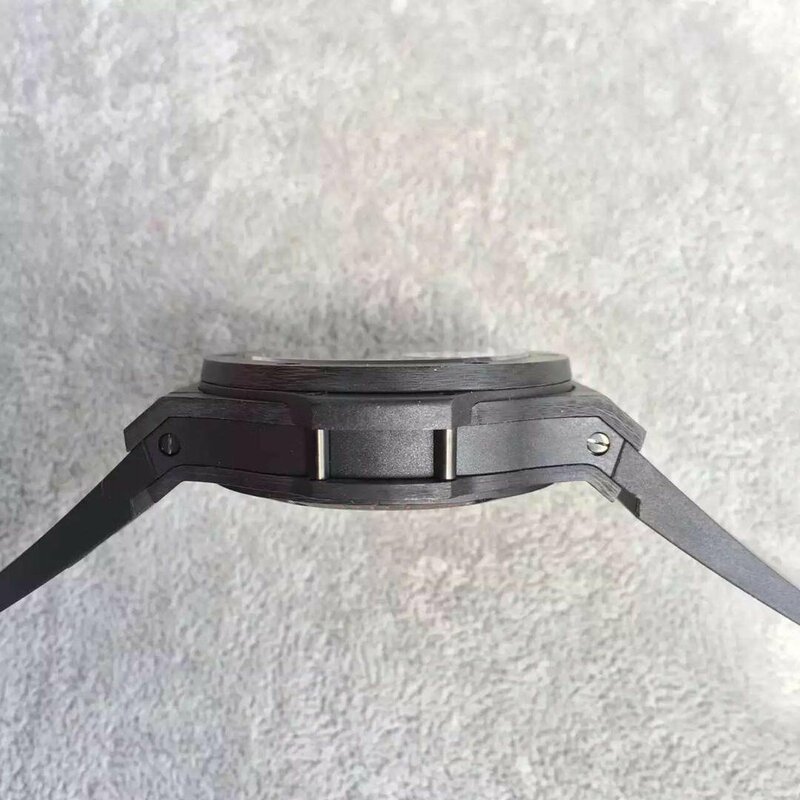 Black ceramic bezel has black rubber being surrounded. 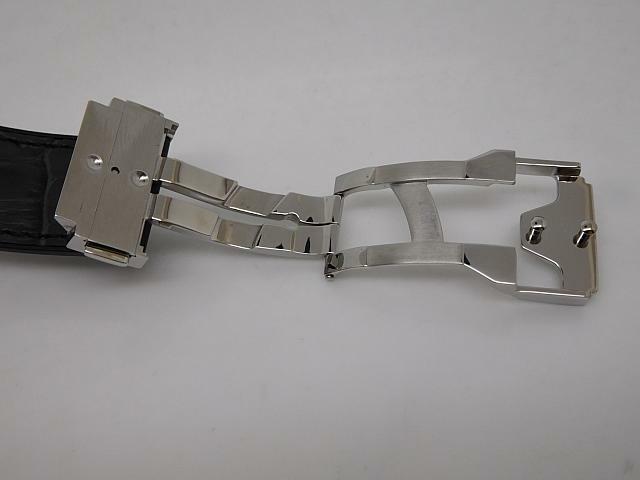 The bezel is fixed by six stainless steel screws in H-shaped. 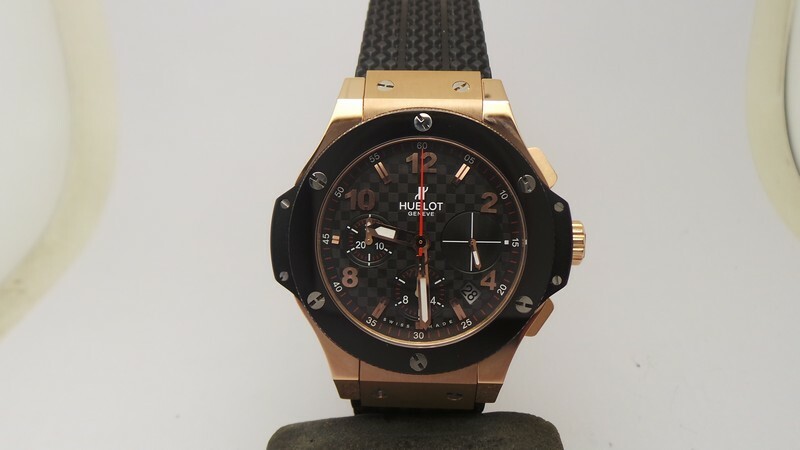 Black carbon fibre dial features rose gold plated hands and hour markers. 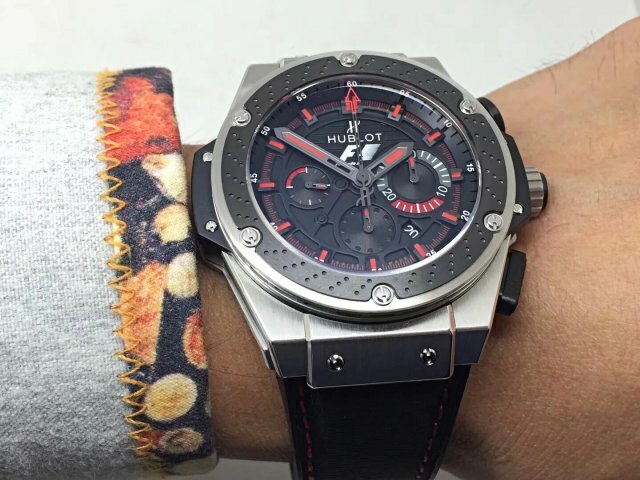 Central second-chronograph hand is in red color that has an iconic H logo. 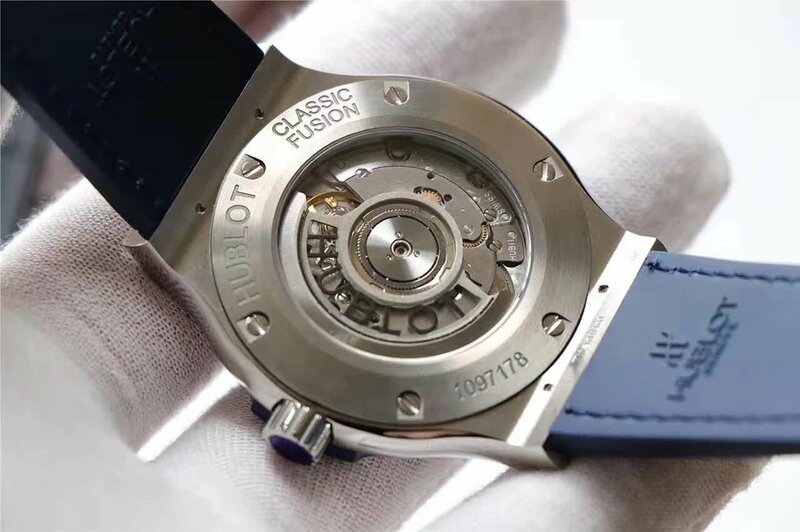 The replica is powered by an Asian 7750 movement, so its chronograph is fully functional. 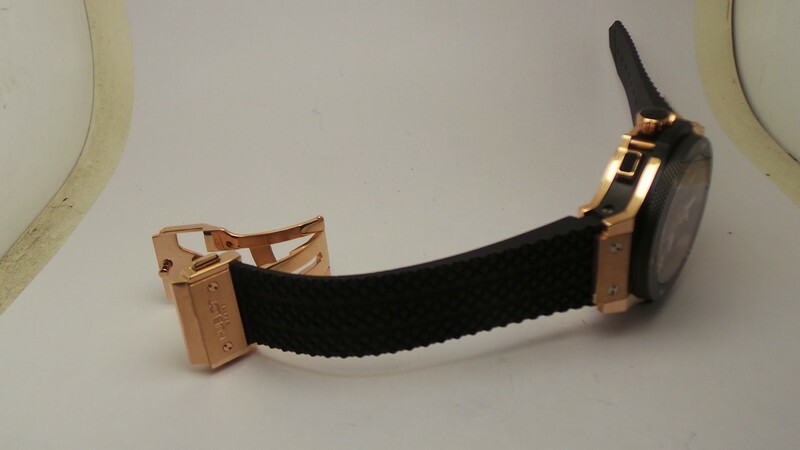 Seeing from the dial, black small-second subdial is positioned at 3, it has a rose gold small hand. 30-minute chronograph counter is at 9, while 12-hour chronograph counter is at 6. There are red minute scales on the ourter bezel of the replica dial. 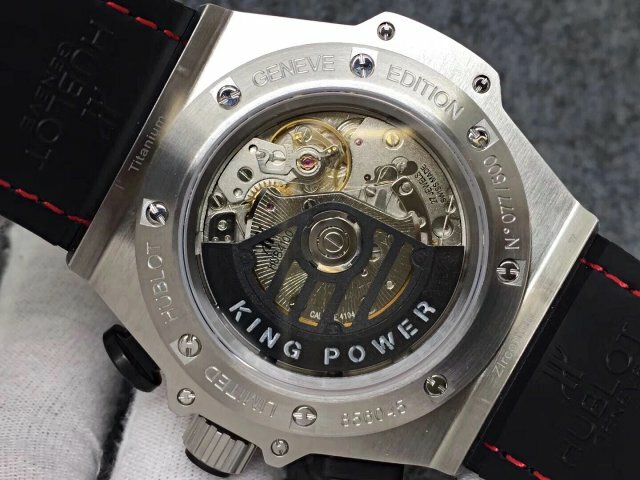 See-through case has detailed engravings on caseback rim. 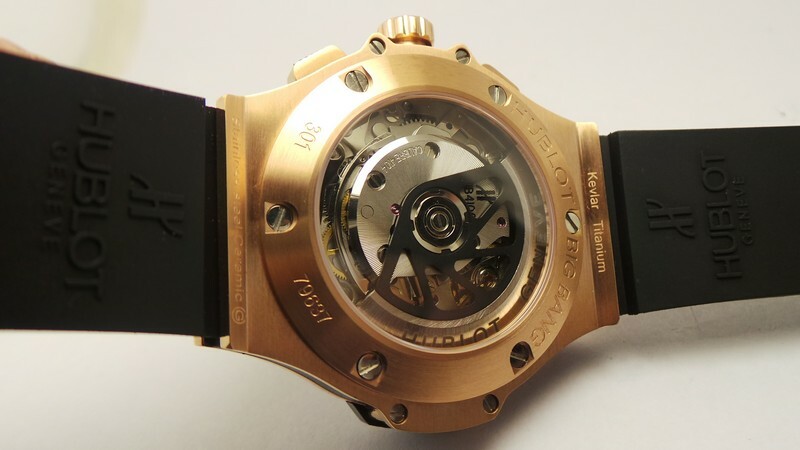 The displayed movement has decorated insignia rotor, the whole movement plates and rotor are modified to thr outlook of HUB4100 calibre. 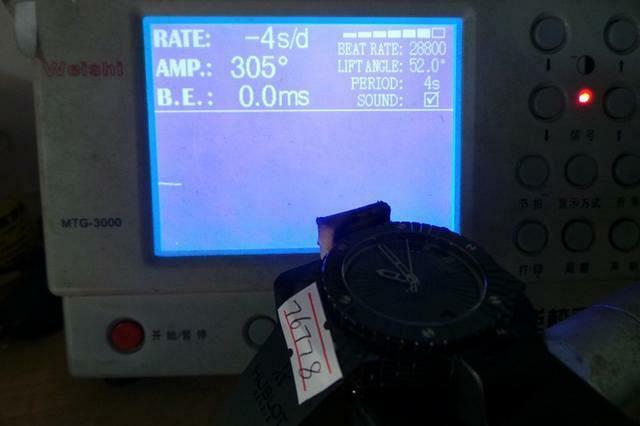 The chronograph automatic movement inside is accurate and stable, as you can see from the movement testing result on the picutre above, it only has 9 seconds inaccuracy each day. 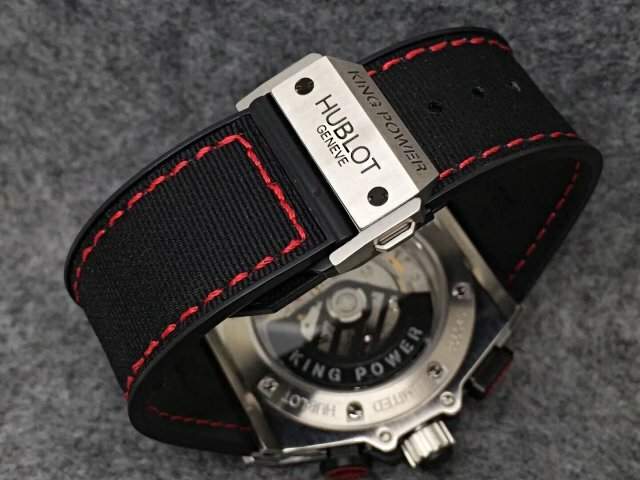 By the way, the black rubber strap used on this replica Hublot uses imported natural rubber material from Thai. 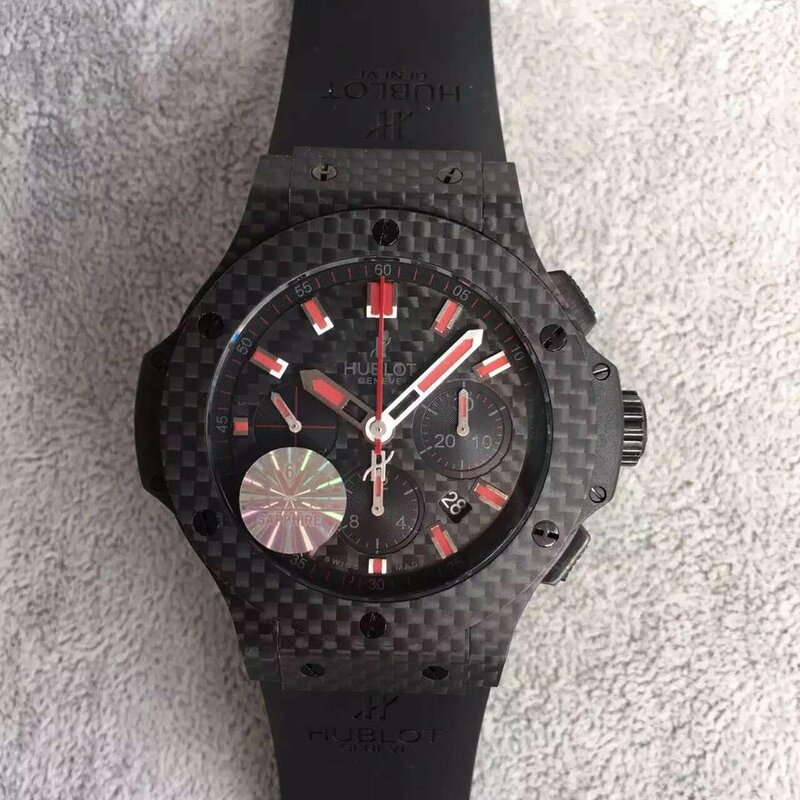 Another 1:1 replica watch coming from the market, the factory bought a genuine watch and has it being fully dissected, it is the real 1:1 replica and each watch part could be exchangeable with genuine. 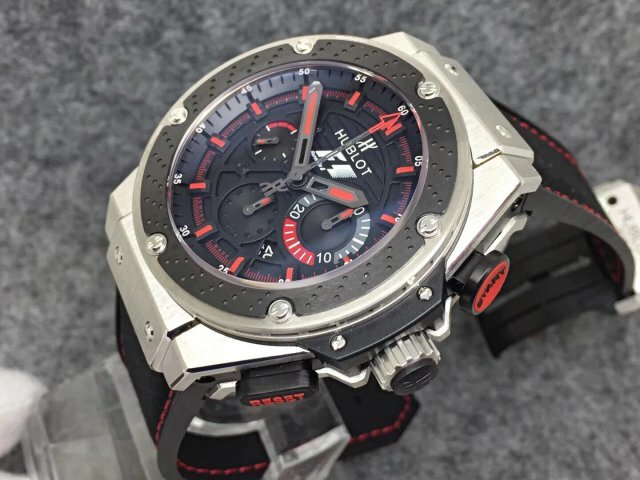 I like Hublot watch because its unique sporty outlook, the Red Magic collection not only inherits the traditional design of Hublot, but also owns its own features. Black and red colors are very classic match in fashion field. 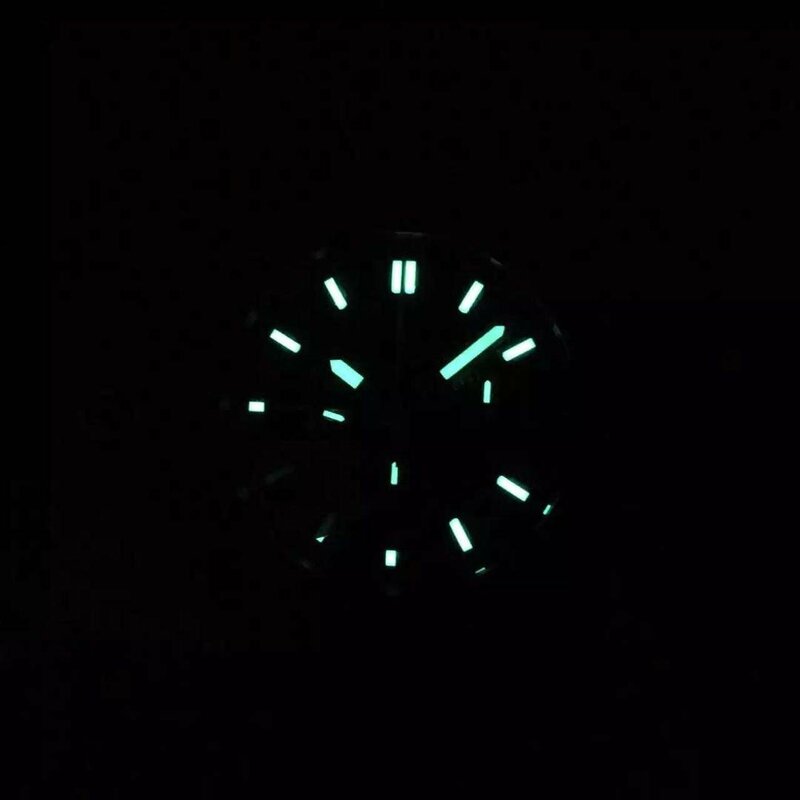 The dial is the most beautiful place I love about the watch, red background with red hour markers and hands, the watch gives you a superlume effect that emits green light in dark palce. At 4:30, a square date window is positioned, white date font in black background, which has a high readability. All numerals on main dial and subdials are in white color, so it is very easy to read time from the dial. The case is full ceramic as per the genuine watch, it also owns the same construction as original watch, matt black case gives you a superior hand touching, there are h-shaped screws in polished, let’s see the case back, it is see-through crystal, on the outer metal ring, there are red letters and reference number engraved. 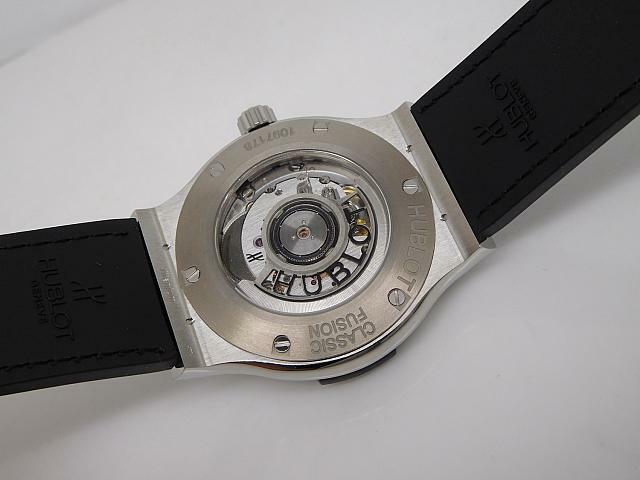 From the case back, you can clearly see the movement inside is HUB4100, actually, it is just an Asian Valjoux 7750 movement, and it is modified to the outlook of HUB4100 movement. 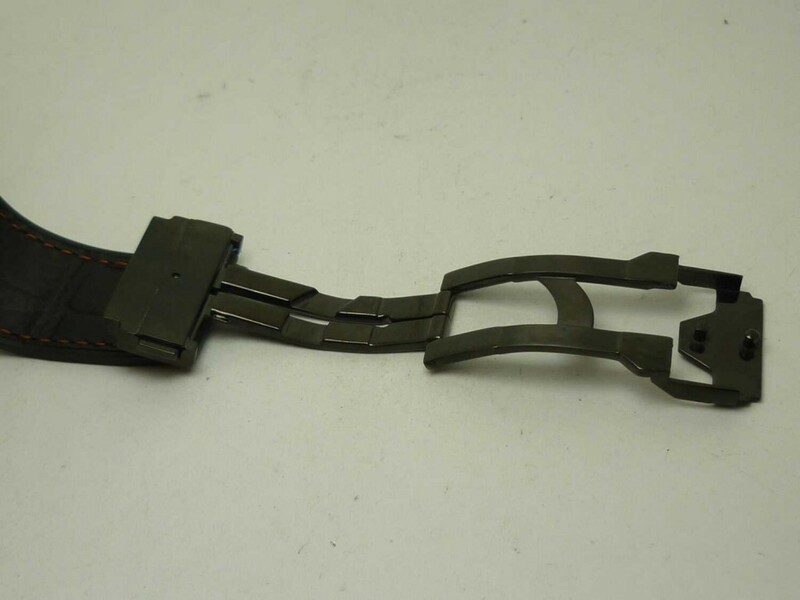 But it can not be denied that the movement is in superior quality. A full functional Chronograph, beats at 28800 times per hour, platinum plated bridge and movement rotor, more important, the detailed engravings are made very close to genuine. 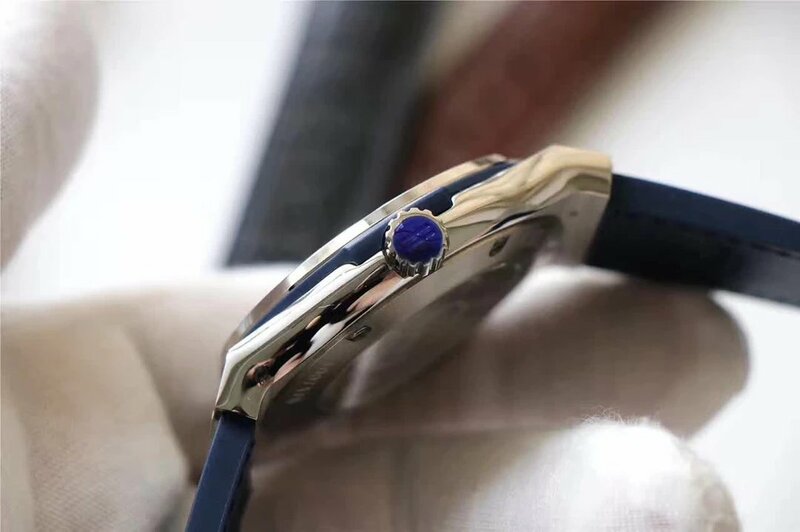 Case and bezel have top brushing craftmanship, straight grain ceramic bezel, the case has smooth edge and corners that give you a high quality feeling. 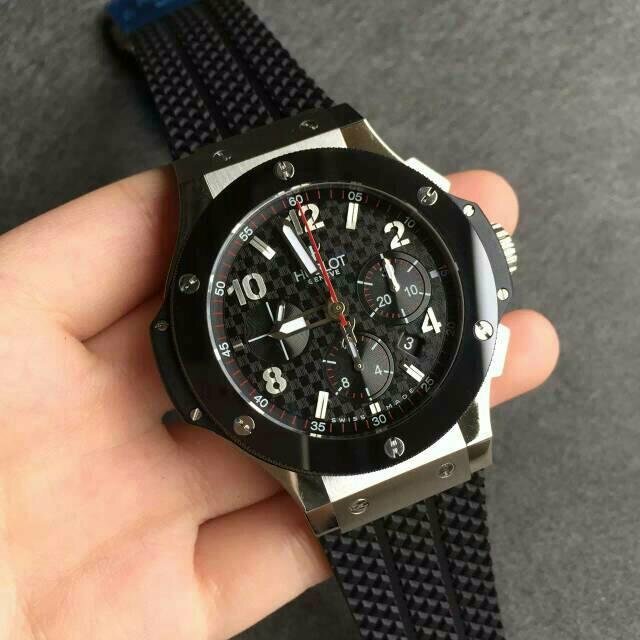 The technology used in making replica watches make great progress each year, only people who has bought it can feel its superior quality.